BANGLADESH – For the first time in the history of international trade in the Indian subcontinent, a cargo truck that departed from Expo Freight (EFL)’s Tongi warehouse in Bangladesh on August 27th was allowed to proceed in to India after clearing customs at the Benapole-Petrapole border. Carrying cargo for EFL’s clients Marks & Spencer London, the truck then continued to travel for more than 1500 km before reaching its final destination in Alipur, Delhi on 5th September. 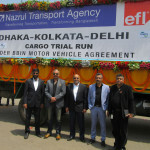 Orchestrated by the Bangladesh and India offices of Expo Freight Private Limited (EFL), in partnership with Nazrul Transport of Bangladesh, this first time trial run of a cargo truck from Bangladesh to India was made possible by the BBIN Motor Vehicle Agreement signed in 2015 by Bangladesh, Bhutan, India and Nepal. The agreement has paved the way for the easier passage of trucks between the four countries as it no longer requires the trans-shipment of cargo from one country’s truck to another. Companies with freighting needs in the Indian subcontinent can now avail themselves of greater transportation options as the BBIN agreement has made motor freight more efficient and economically competitive against air and sea freight. According to a press release by officials at the signing of the BBIN Motor Vehicle Agreement, the transformation of transport corridors into economic corridors could potentially increase intraregional trade within South Asia by almost 60% and with the rest of the world by over 30%. The BBIN framework provides for greater regional integration between the four signatory countries, enhancing the possibilities for mutual cooperation and greater cultural and economic exchange. Motiur Islam and Mohammed Rasel departed from Expo Freight (EFL)’s Tongi warehouse in Bangladesh on August 27th 2016, For Islam and Rasel, the two men who drove the truck from Bangladesh to Delhi, this trip marks their first time in India. “It is a proud moment for us. I enjoyed driving on the Indian roads,” said a beaming Rasel.